Animal Friends reacts to an increasing promotion of ostrich farming in Croatia. The ostrich meat is more and more mentioned and promoted as a delicious morsel, and often also as a substitute for the beef that people tend to avoid because they fear the mad cow disease. Because of the fear of the mad cow disease that was, let us not forget, caused precisely by the human greed and cruelty, the Croatian public is, among other things, also encouraged to eat ostrich meat, and the farming of those animals is presented as a "lucrative business," when actually it is a business based on the unnecessary cruelty. We would like to remind you that the ostrich is an African animal belonging to a completely different climate and environment. Why is it necessary to farm the ostriches from African deserts in our country and, moreover, to present that as a "lucrative business" and a growing industrial branch? The protest will take place in front of hotel Panonia in Sisak on Sunday January 27 at 10:30 A.M., where a seminar about ostrich farming will be held. Thirty members of our organization will draw the attention to their disagreement and concern regarding the farming of those beautiful African birds. 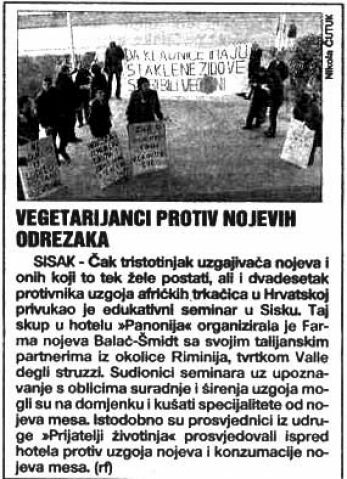 We kindly ask the public not to support the ostrich farming, as well as not to buy or eat ostrich meat, and we kindly ask the (possible) farmers to think about some other industrial branch, like for example the bioorganic food growing, the consumption of which increases by 200 to 300 percent each year only in Croatia. The organic vegetarian food growing is a profitable and right kind of investment, although it is not presented that way, and on this occasion we would like to draw the attention to this alternative as well, as a substitute for greater and greater promotion of the ostrich meat. Shouldn't the entrepreneurs be turning to eco-tourism and health food, and not promote the cruelty and participate in increasing the number and types of slaughterhouses? Whereas in Australia, for example, the ostrich farming is legally forbidden, and Croatia is slowly transforming into the major European slaughterhouse, it would be interesting to notice the fact that the citizens of Karlovac, because of the fear of the mad cow disease and numerous other diseases connected to the meat diet, still don't believe that the vegetarianism is a safe, healthy and ecologically acceptable diet, but they bring the animals from other continents in order to replace the existing ones. Today it's ostriches, maybe tomorrow it will be monkeys? Where does the human wantonness end? !